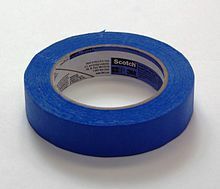 A low tack masking tape. 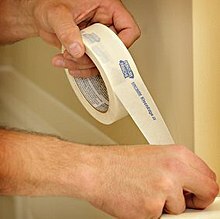 Masking tape was invented in 1925 by 3M employee Richard Drew. Drew observed autobody workers growing frustrated when they removed butcher paper they had taped to cars they were painting. The strong adhesive on the tape peeled off some of the paint they had just applied. Touching up the damaged areas increased their costs. Drew realized the need for tape with a gentler adhesive. When constructed with plastic films instead of paper, masking tapes can be used for more rigorous applications. Polyester-based tapes are used to mask off during etching, plating, and in particular, powder coating. Tapes based on polyimide films can resist molten solder in electronics applications. Glass cloth tapes are often used in powder coating and sandblasting operations. Foil or vinyl tapes are often used in plating. Layered tapes made from multiple materials laminated together can be used for masking flame spray, thermal spray and HVOF. Masking tape can also be used to adhere posters to walls up to the day rating. 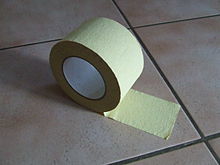 Masking tape can basically be used for any purpose required of it, and is not limited solely to painting needs. The adhesive applied to a tape is often a critical determining factor for a given masking situation. There are three thin types of adhesives (with many chemical variations of each): rubber-based, acrylic-based, and silicone-based. Rubber-based adhesives generally provide the greatest adhesion, but the lowest temperature resistance. Acrylic-based adhesives offer a wide temperature range, providing adhesion from sub-freezing temperatures up to 275–325 °F (about 150 °C). Silicone-based adhesives provide the highest temperature resistance, with some tapes (such as some polyimide films and glass cloth tapes) allowing for intermittent use up to 500 °F (260 °C). Nowadays masking tapes are widely used for decorative purposes. These types of decorative tapes are called Washi Tape and can be purchased at a variety of craft specialty stores and online. They are printed with different patterns, symbols and pictures allowing tape users to add a personal touch to crafts, packages or anything that warrants the use of tape. Some Japanese tapes are made of washi paper. ^ "Inductees - Richard Gurley Drew". National Inventors Hall of Fame. Retrieved 29 March 2015. Wikimedia Commons has media related to Masking tape.